Holocaust Memorial Day recalls one of the worst crimes in human history. It's also a time to reflect on the heroic and humanitarian actions of those who did all they could to stand with the marginalised and oppressed. Whoever it was that chose the date for Holocaust Memorial Day had an eye for the small, glimmering lights even among the darkest shadows. The 27th of January is a day characterised by relief and liberation – the passing of a horrific storm – because on 27th January 1945, soldiers of the 322nd Rifle Division of the Soviet Red Army put an end to the Nazi death camp at Auschwitz. From 1943, the Allied armies had begun to drive Nazism back toward Berlin, destroying its Holocaust infrastructure as they went. Auschwitz’s liberation was followed by others: British and Canadian troops reached Bergen-Belsen on 15th April 1945, while the Americans reached Dachau two weeks later. But there had, of course, been military action against the Nazis on the European continent before the regular armies began to really go on the offensive – that fought by the European Resistance movements. Resplendent with Leftists and misfits, Jewish fugitives and Romani partisans, these groups account for some of the most epic and courageous stories of anti-fascism from the Second World War in Europe. On the afternoon of 19th April 1943, a train had left Mechelen, a city in the Belgian province of Antwerp. It consisted of a convoy of freight wagons, but human beings, not cargo, were inside. The Nazis were driving 1,361 Jews – Belgians and other nationalities – from Mechelen ‘Transit Camp’ to Auschwitz-Birkenau. It was the 20th convoy to leave Belgium for the death camps in Poland. But before the Nazi train could get out of Belgian territory, it came to a screeching halt. On the stretch between the towns of Boortmeerbeek and Haacht, the driver had spotted a red ‘STOP’ light ahead. Or at least, a red STOP light was what he saw. It was actually a paper lantern, brought to the trackside by Dr Youra Livchitz – a Russian-born, Jewish communist – Jean Franklemon – a communist art student – and Robert Maistriau – a clerk at a metals company. All were members of the Belgian Resistance. With the train stopped, the trio set about breaking into the nearest wagon. With just a pistol and a set of pliers between them – and despite a 16 man Nazi police guard – they broke seventeen captives out before the train began moving again. 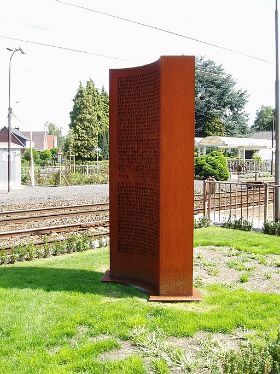 Emboldened by the Resistance action and aided by the Belgian train driver Albert Dumon, who would slow down as much as possible at turns to help with their jumps, 216 more people escaped ‘Convoy 20’ as it moved through Belgium. ‘The Attack on Convoy 20’ proved to be the only mass breakout from a train bound for the Nazi death camps during the war. The attack's three protagonists had defied the concerns of some Resistance superiors that the Jews’ plight, while condemnable, was not a ‘military priority’ – the same logic used by the United States, Britain, and other Allied governments who persistently refused to send bombers against the known death camps. But Youra Livchitz, Jean Franklemon, and Robert Maistriau saw it as their resistance duty to harass the Holocaust machinery whenever they could, as much as they could. Livchitz was arrested by the Gestapo a month after the attack. Despite later escaping (from Gestapo HQ in Brussels! ), he was recaptured, then executed on 17th February 1944. Franklemon was arrested in August 1943 and spent most of the rest of the war somehow surviving as a Resistance prisoner in the concentration camp network he had earlier risked his life attacking. He died in East Germany, aged 60. And Maistriau managed to join up with the Belgian partisans fighting in the Ardennes forest. Caught by the Nazis in March 1944, he too was thrown into the concentration camps but lived to see liberation at Bergen-Belsen in April 1945. Of the 233 Jewish captives who broke out of Convoy 20, 118 survived the war – something which would have been near-impossible if they’d reached Auschwitz. The question always hovering over Holocaust Memorial Day is ‘how could human beings do this to one another?’ And it's a vital question for the practical politics of anti-racism to answer. But I nevertheless always try to join it with the question: And how did people stop them? The answers you discover – like the self-sacrifice of these three résistants in April 1943 – are always cause for a steely confidence in the face of modern fascism: humans, it turns out, can do incredible things to protect each other from marginalisation and oppression, even in the face of pure evil.